I may make a goose of myself but the upright patterns? Well if we’re wrong, make that geese, as in 3! Yep my thoughts exactly. And he cost a motzah. And he cost a motzah. I had a foal so knockneed i thought he would have to be put down. now a 4 year old as straight as a die, without intervention. With maturity that foal will develop nicely. past practices had vets interfering to the detriment. is amazing what nature does. Intervention isn't on. Nature can heal, but not so in this case imo. Whilst the angle might change the youngster will always be too straight. the angle of the shoulder will dictate the angle of the pastern. Correct. However that observation isn't going to change the angle of this one's pasterns. Just jokin - Shadai Farm's Mikki Isle – My Jen colt was purchased by Ryotokuji Kenji Holdings for 22 million yen ($A265,000). My Jen's first three foals sold for low prices and have done nothing, so can't quite work out why this one sold so well. in the end a nice sprint conformation. Nicer than this one that went for 500k, same sale, by Maurice. Do some hard yards please Isaac. 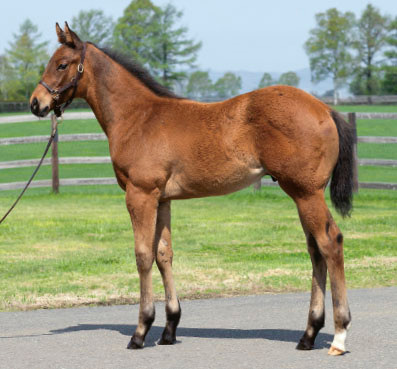 Her first three foals sold for an average of about $7,000 Aud and were by Champion sires Deep Impact and Hard Spun. you dont think 265k is average nowadays? an auction? you should know only takes two to really want something to push the price along. Yes $265k is about average Isaac. But perhaps overs for a sibling to three failed horses sired by two champions, almost not to mention for a foal with a clear conformational fault. I would think a the pasterns would be more a fault if the shoulder angle was more pronounced which it is not . By memory Statue of Liberty has very upright pasterns but didnt stop his ability on the track or in the barn . In saying that his track career was short and his best progeny Had pretty bad hoof crack issues .Alot of foals seem a little upright to start but this foal is more than a week old .I hope it runs like the wind . I accept everyone's concern about those pasterns but what jumped out at me on both of those foal pics were the knees ... top one is more so but both look to my eyes anyway as if they (the knees) are turned out in relation to what is above and below them. Foals are naturally more upright than yearlings, he looks fine to me in that regard. Much better being a little upright than too slack, especially in Australia.